You certainly don’t need to be telling me how difficult it is to put competitive teams on the field. Cairns, in northern Australia, is not an Australian Rules football stronghold. Whilst we have been able to procure AFL matches and a healthy local competition at senior and junior level, the fact remains that we are in a part of Australia that is Rugby League territory. When we get a team on the field it comes from an enormous amount of recruiting work to convince kids especially to try the game. My own work since 2001 in getting school kids into the game has paid dividends, yet cancelled games still litter our code at junior levels. Too many, sadly. So, I have some empathy with AFL England when they put out social media announcements to try and get past teams such as the Sheffield Thunder, Leeds Minotaurs and Birmingham Bears from the AFLCNE, or the Bournemouth Demons and Surrey Stags from the Southern England AFL to rebuild. It isn’t for a lack of desire on the part of those still involved in the game. Football is full of heroes that keep the flag flying when clubs have otherwise shut down. The problem comes with recruiting and retaining players. Teams in England (or elsewhere for that matter) don’t really need to hear from an Australian in Australia – by comparison, we have players and potential markets growing on trees. Our situation is different, though with its own sets of challenges. But I can help in a small way by sharing some things that may just help. Most have already been done before, but it never hurts to go back to some things and try again. I chatted with AFL coaching legend, Kevin Sheedy once for an interview, and he had some advice for those growing the game in difficult markets. In a nutshell, his advice was to adapt the game and keep adapting to suit the market. He pointed at three key areas. Initially, he pointed out that clubs and leagues need to be prepared to change to suit the environment. His argument was that if a league needed nine, eight or seven players per team to remain viable, do it. He implied that enforcing rules that create such a rigidity that a club’s viability is at risk is not working towards the longer term gain. He cited the team number example, but also pointed out that modified rules, venues and skills can be incorporated to open up opportunities. His next main theme was grass roots. This is an area of the game expanding across Europe and particularly England with recent junior locations announced. Many clubs have already had people in schools and will continue to do so. I know that a few good friends of mine in England and Ireland have introduced very successful Australian Football curriculums into their own schools. My own club here in Cairns, Pyramid Power, has forged very strong links with local schools to try and tap the potential on offer. By visiting schools, running clinics, sponsoring school events donating equipment we have got the schools onside and they, in turn, actively try to help us. The same could be done in other locations – schools foster links with local schools. Hybrid games was another area that Sheedy highlighted. Rather than ram Australian Football down the throats who don’t wish to be fed that way, he has offered the idea of hybrid rules. 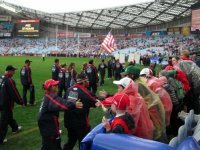 Many are already done as training skills with European clubs – handpassing matches, goals only matches using soccer or rugby posts, bringing Australian Football skills into other games (I once created volleyball games at my school where the serve was a kick and the subsequent passing had to be a handpass). In short, Sheedy’s view was to think outside the square to find whatever ways possible to grow the game. The under arching question here might be whether some clubs that once existed still would be here had some situations been different. I do hope that each of the bygone clubs mentioned above can recruit and get back into the game. But it might also be time to take a Sheedy-esque approach to the game and look laterally at what might be done to change the landscapes. In no way is this article suggesting that not enough is being done by clubs or leagues – far from it. It is remarkable how far clubs and leagues have come so far. But status quos don’t always stay the same. I case in point would be the AFLCNE. It wasn’t long ago that the league boasted seven plus teams and a growth rate that was exciting. However, gradually losing the Minotaurs, Thunder and Bears as well as the Tigers relocating to the SARFL has left a void. It is possible that the AFLCNE be looked at through another lens – lateral thinking, something different. Maybe then some phoenixes might arise. As an example, which I didn't put in the story, is it possible to have second tier competitions? "A" Grade can be played with teams that have access to 9 or more players on a regular basis, whereas a "B" Grade could possibly be two of three other teams playing a smaller 7-per team competition which has less pressure on numbers but keeps them in the mix and as they grow, the can be elevated to the "A" Grade. Maybe this is fanciful, but it is an example of the "thinking outside the square" that might just help teams along. Again, there is a touch of the Sheedy interview in that idea. I'm not sure what you are trying to say Wesley. I see clubs moving from one competition to another, not as a loss but 'adjusting to local' conditions. Isn't that what Sheedy says ? From my experience, clubs have tried just about everything concerning the game - numbers, competitions, quotas, rues, genders, ages, tackle, flag, indoor, schools, universities. They have international competitions, national competitions, city competitions, metro leagues, school leagues and indoor leagues. They've demonstrated at professional CFL, MLS, rugby and gridiron games. They've demonstrated at schools, fairs and universities. They've approached clubs, councils, governments and embassies. They have approached the AFL. IMO more attention has to be paid to those actually at the coalface. All around the world the accepted standard is 9-a-side football yet the AFL doesn't recognise this and tries to promote AFLX - a game suited to elite level players, not overseas players. In North America they developed Ausball as an important developmental tool. The AFL, again, ignores this and promotes IR. The AFL promotes IR at the expense of any potential AFL promotion. The template for producing 'participants' is now well and truly established. It doesn't need any thinking outside of the square to know what's needed is follow-up to convert a percentage of 'participants' into full-blown players. What I am offering, Harley, is a couple of thoughts directly responding to an AFL Europe Facebook post imploring people in the areas around the Leeds Minotaurs, Sheffield Thunder, Birmingham Bears, Bournemouth Demons and Surrey Stags to try and get back and resurrect those clubs. It would be great to think that the gradual regrowth of those clubs would happen by following all set conventions, rules and policies, but I doubt that's enough. By drawing on my interview with Kevin Sheedy from a couple of years ago I have lifted a couple of thoughts that might help to view the landscape differently. I agree that Tyne Tees Tigers relocating is a good thing for that club. But I would argue that their departure on the back of losing those other AFLCNE clubs in recent years cannot be a healthy thing for the league or the game. I think the point you make that the AFL is responsible and should be doing more is frustratingly true for all clubs and leagues outside of Australia. But at what point do we feel that the AFL will realise their responsibility and rectify things? can clubs and leagues wait for that? Or can clubs and leagues make changes to suit their own needs? Why not? Sheedy doesn't care about 18 a side, 16 a side, 9 a side, 7 a side, 4 a side. All he cares about is two sides to generate a competition and he said that outright in my original interview. If I followed every edict of AFL Cairns up here and took simply what they offered, we would have lost most of our kids to rugby league. We would not have the teams or pipelines now available if we waited for local authorities. I operated totally outside of the AFL by running matches, leagues and carnivals to make sure the kids played. I ran indoor summer handpassing comps in a northern summer to keep the flag flying when AFL Cairns was more worried about local elite pathways. Maybe they are right because Jack Bowes, Jacob Heron and Caleb Graham are now at the Gold Coast Suns. Three kids after years of pathways. Yet where I am we have an entire club and district embracing a game through our own passion and nominal support from the league. So, by all means, follow the rules and wait for the cavalry to arrive. Maybe they will, maybe they won't. But as an alternative, why can't clubs, leagues explore outside the box as Sheedy himself has suggested they do. All I have done is given voice to the idea. Others will decide the value of what has been said. You miss my point completely. 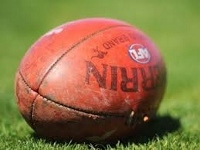 It is not a question of AFL responsibility but "IMO more attention has to be paid to those actually at the coalface.". That is, the AFL need to pay more attention to those who do in fact "think outside the square". I can criticise certain people and groups for 'waiting for the cavalry', waiting for the AFL, a celebrity or an elite football player to appear. Some even reject help if it doesn't come with a letter of introduction. Where there has been success It has been agonisingly slow for those people who have produced outstanding results to be offered assistance. I can criticise certain the AFL, celebrities and elite football players as being uncontactable. Unfortunately I cannot offer assistance to people coming to me for this reason. It is really embarrassing that the AFL is not interested in individuals (outside of AFL standard). I can criticise people for not thinking within the square and not doing the basics low-cost basic like establishing a database of leagues, clubs, players, umpires and associations. Who's forming committees or running surveys ? It's basic stuff. Why can't AFL clubs put on simple demonstration games or at least engage the local clubs when then they train overseas. here's a thought. If two AFL clubs trained at that the same destination they could have an AFL game at also zero extra cost. As for AFLNE it is obvious that someone should analyse why there was rapid expansion and why the situation changed. In my experience it is often the aussies that are both the creator and destructor of football clubs. I'm not sure how Sheedy's rhetoric could help AFLNE but maybe if the AFL viewing was more accessible to those outside of Australia that would help to promote interest. More than a decade ago I suggested that the key was greater co-operation, with databases, player pathways and volunteer pathways. For any thinking to be effective it has to be listened to.